A spice valued at three times the price of gold has returned to Essex, after the crop was abandoned 200 years ago. For centuries saffron was grown around Saffron Walden but as harvesting the crocus bulb was so labour intensive, it became too expensive to produce. Farmer David Smale has planted 150,000 bulbs at three secret sites around the town as it is still in demand. More than 90% of saffron is grown in Iran, with some produced in Greece, Australia, India and China. It is used to give an earthy honey flavour to food dishes and colour to liqueurs. Mr Smale said the earth around Saffron Walden contained nutrients which gave the saffron a distinctive Essex flavour. "I read that this part of the world was famous for the plant centuries ago and set out a few bulbs as an experiment. "Now I get orders from top stores in London and have expanded production to 150,000 bulbs a year." 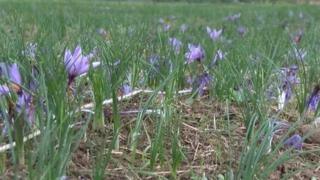 At its peak, Essex saffron spice was exported all over the world, he said. Now he believes that he is the only grower in the county. "Each flower has to picked by hand before processing. The three stigma are taken out of the bulb and then dried. "A gram of dried saffron will sell for about £75 at top London stores - that's about three times the price of gold," he said.